Ok. I will eventually, but first, let me say: Fokkies. People. It’s almost Christmas. I know it’s the end of the year when dragging my backside through the last month and seeing the days whizzzz by fill me with equal amounts of dread and glee. To-do lists seem to get longer and longer, projects *have* to be wrapped up by the end of November. I also know it’s the end of the year when I no longer have any filters and some of the things that come out of my mouth make me cringe. My Boss calls it ‘Interpersonal Sensitivity’. I call it ‘Too tired to put up with crap’. Tonight I realised that I’m doing the same as every year: buying too many little stocking filler gifts for the kids and contemplating the utter futility of buying expensive toys. Toys we spent time agonizing about, not only because there are 3 children and it adds up WAY too quickly, but also because we would hate to ruin Father Christmas’s reputation of buying the perfect gift. I really do wonder what the point is of buying toys. Our lot are quite content to play silly games with each other and, really, they (mostly) hold no educational value. But then it wouldn’t be a toy, now would it? What are you buying your kids for Christmas? Do you agree that buying toys are more often a monumental waste of hard-earned money than anything else? This is one of those posts that I hope comes out the right way. My blog is not monetized. There are no adverts, no giveaways, no pretty widgets and plug-ins. I’m trying to keep it as clean and simple and honest as possible as there is enough noise on the Internet. I don’t have a Facebook page on purpose (although I do sometimes toy with the idea). I’m not driven by numbers. In fact, the blog was private for a while this year and I’m still trying to come to terms with what I deem appropriate to share and what to rather keep within the confines of our home and closest friends. Emotionally it’s been a tough year, but I’m gathering myself toward myself. As you do. I’m torn between wanting people to read (I will always love seeing people comment, even though I’ve unwittingly made it difficult for people to do so until today, thank you Laura!) and not wanting people to read (I feel too exposed, too judged, too emotionally fragile to deal with trolls). I battle to find the right tone at the moment, I have to dig deep to see the funny some days, which is why I have to keep writing. It forces me to put things into perspective. I have also neglected reading some of my favourite blogs – especially the local ones – and now I remember why I used to love reading them: they often put life into context. I haven’t opened Bloglovin for most of the year as, quite honestly, seeing all those unread posts make me want to run screaming (I really miss Google Reader btw, everything was *just* right). What I’m really enjoying are the “quiet” blogs, the private thoughts that aren’t publicised. They somehow feel more honest, less contrived. Their intent, like mine, isn’t to generate income, it’s there for an outlet and support (I think). It’s like The Underground of Blogging. It’s so easy to get sucked into chasing page-views, optimising what you write for the Whole Wide Web to read. It’s so liberating not to give a toss, mostly. Read it, don’t read it. But for those of you that read and keep coming back I just want to take a moment to say thank you. Thank you for reading. Disclaimer: I wasn’t compensated in any way whatsoever for writing this or asked to write about it, let’s just call this post Paying it Forward. 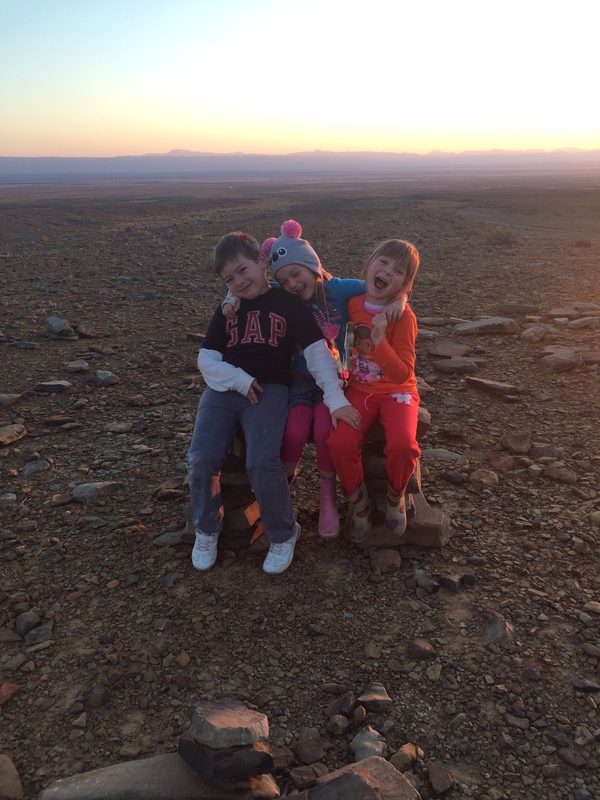 During the school holidays we decided to take the kids where there was no signal, no tv and no devices (ok, mostly no devices) and ended up at Skoorsteenberg in the Tankwa Karoo. To get there you have to travel about 80 odd kilometres (the road between Ceres and Calvinia, at 270 km the longest gravel road in the country) on gravel and we passed 2 cars that had flat tyres as the gravel there tends to cut tyres, so bear that in mind if you do go. The landscape is flat, lots of little bossies and very few trees as far as they eye can see. Just what we wanted: peace, quiet and a little desolation. And breathtaking sunsets. The kids had an absolute ball, they climbed “the mountain” (a koppie) about a gazillion times a day to go and sit on rocks or walk the mandala that the owner, Nana’s, daughter had packed out in stones. We played Uno and Jenga, we built puzzle. We read and talked and walked. Mostly we played a silly Moshi Monsters card game that Daniel got in a magazine. As a side-note, he cheats shamelessly, the sussies couldn’t understand why he kept on winning until we intervened and they kept calling him out on it after that. We were really lucky with the weather, no wind at night and lovely warm winter’s days, so we could sit outside after the sun went down and the kids were asleep. The cottage itself is really well equipped, it has the 3 things I usually miss at places we stay: proper wine glasses, big coffee mugs and sharp knives. A big win in my books. It also has a gas heater and warm water bottles for every person. There is no fireplace inside, purely because the house is really well-insulated and the small matter of no trees = no wood to speak of. But don’t let this deter you. The other thing I really liked is that they recycle EVERYTHING. They separate plastic, glass and paper and pretty much everything else goes to either the compost heap or the pigs. I was a little horrified at how quickly the plastic bin filled up, I’m definitely more conscious of how much plastic we use. Scary. 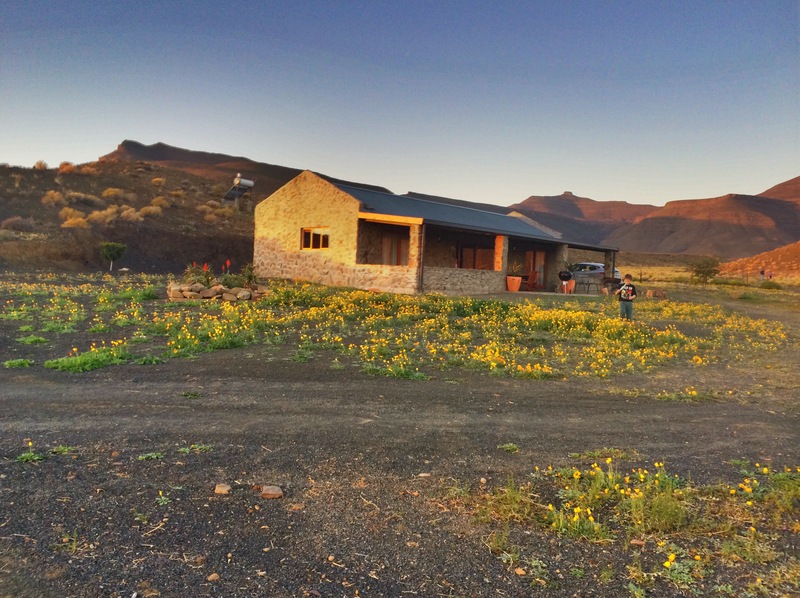 Lastly: on the way to the farm you must stop at the Tankwa Padstal, but don’t get stuck at the bar, be warned, you still have about 40 km gravel road to travel.